Add some color to your learning with our Rainbow Fun complete lesson plans. 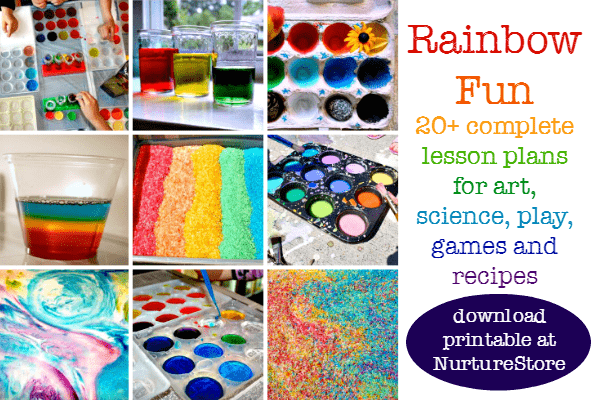 This set of resources gives you everything you need to plan a program of art projects, science experiments, recipes, games and songs, all with a rainbow theme. 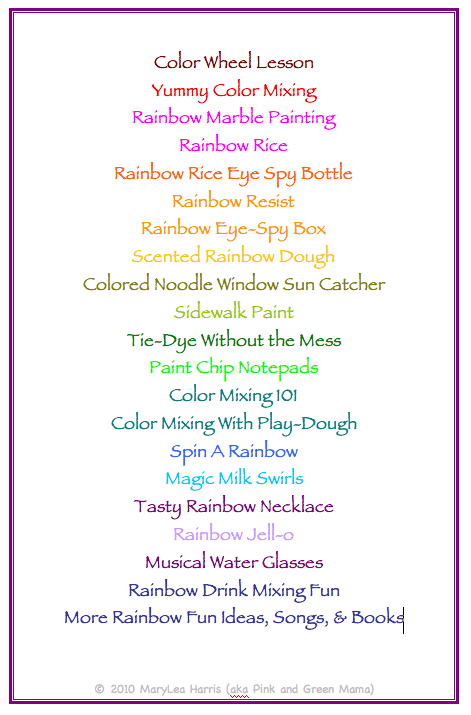 This comprehensive resource is written by MaryLea Harris and draws on her many years of experience working with children in art classrooms. MaryLea is an artist, art teacher and mother of two. 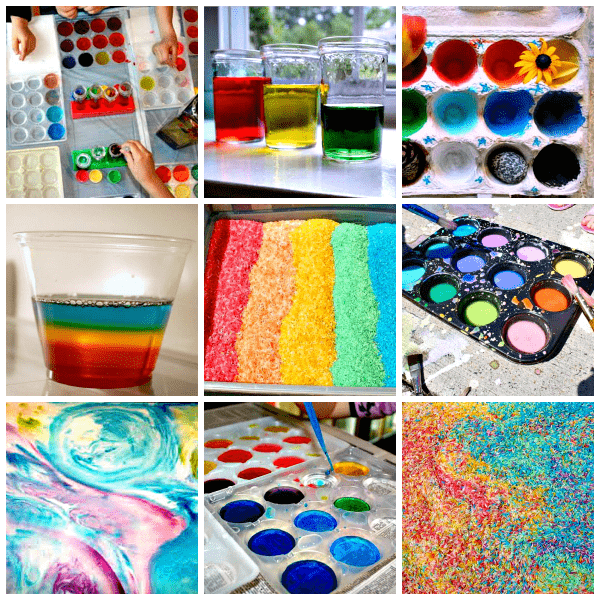 She combines her formal art training with her hands-on work in schools and art camps to create a resource which is easy to do at home or in class, fun, colorful, and which offers a rich arts and science education experience. Download your copy here. :: delivered as a pdf download, which you can read on screen or print. The program can be done individually with your own child, or in a large group, or classroom setting. You can do several lessons together, like a camp experience, or spread them out over several weeks or months. 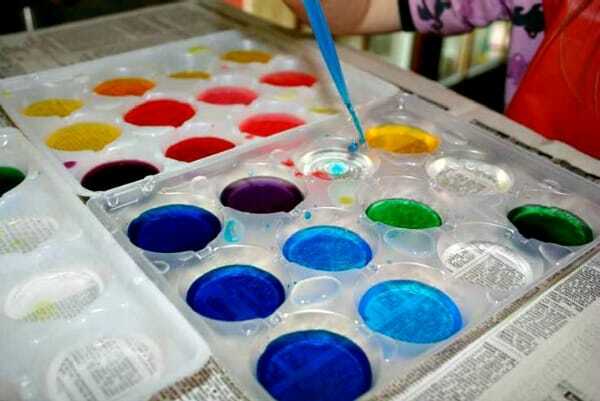 The projects are best suited to 5 – 10 year olds, but can also be done with 3-4 years olds. 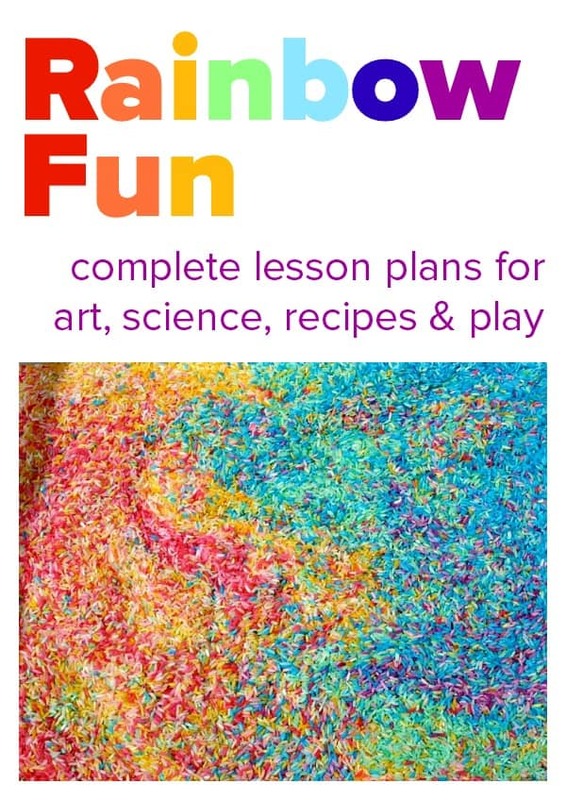 Hi, I just purchased your rainbow ebook with the discount and paid with PayPal. I could not then download the PDF. I have previously bought your ‘exploring artists’ without a problem. Hi Erma, I’m going to email you now to help you fix the download. I appreciate your site a lot. I am doing my Diploma of Early childcare Education. May I ask if you deliver, Ordered books to Australia. I am very interested in ordering some books please. Hi Pamela. Yes, the books are ebooks, so they are delivered as a PDF to download, and they are available worldwide.